It’s possible to prepare and format your manuscript without knowing the programming code used in e-books. All you need is Word and step-by-step instructions. Practical Guide: Formatting e-Books for Writers gives you those step-by-step instructions in non-technical language. Download a Sample Chapter. Receive a free Kindle version with the purchase of the print edition. 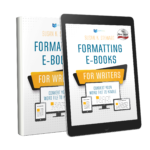 Download all the resource information found in Formatting e-Books for Writers Formatting Resources.